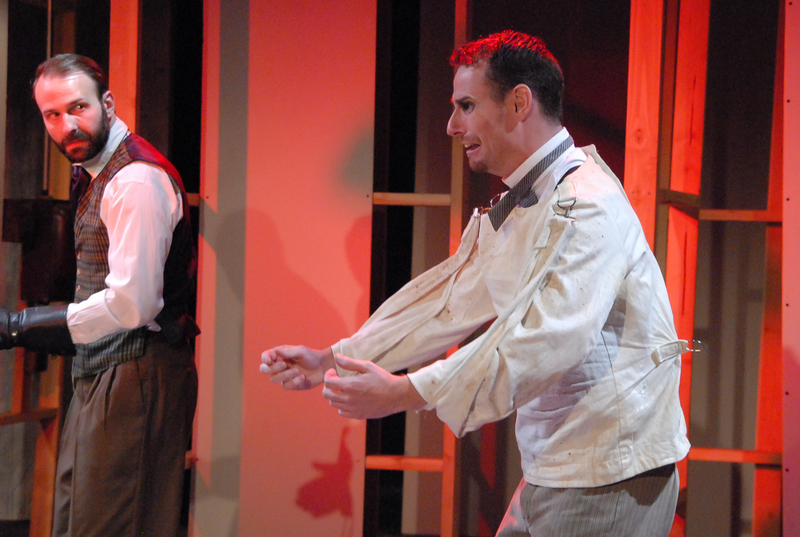 (from left to right) Thaddeus Shafer as DR. DUCHENNE and Andrew Eldredge as PEPE. Photo courtesy of Elena Flores. Four Clowns’ newest theatrical staging is Lunatics & Actors, written by David Bridel. Bridel’s one-act drama is posited as an anthropological and scientific experiment in progress, with some results and further experimentation being presented this night to a collection of interested persons (being us, the audience). The play commences when an eccentric neurologist, Dr. Duchenne du Boulogne (Thaddeus Shafer) introduces himself to us and explains his work to date; being the science of electrophysiology. The play does have an interesting premise. It is set in unsettling world — a 19th Century Parisian medical clinic — where a strange experiment is about to unfold. There’s a palpable sense of menace as it transpires that any one of us in the audience could become the next subject of the evening’s disturbing scientific demonstration. Dr. Duchenne converses with three audience members – all purportedly actors – who each volunteer to come to the stage to explain their craft and chosen career. We then meet three of his test subjects — drooling lunatics secured in straight jackets — who are subjected to painful electrical stimulation to do the Doctor’s bidding. Dr. Duchenne is known, in particular, for the way he triggered muscular contractions in his subject’s faces by use of electrical probes. The lunatics are: Tyler Bremer as Bon-Bon, Andrew Eldredge as Pepe, and Alexis Jones as Fifi. Regrettably Lunatics & Actors suffers from loud and pompous overacting from almost everyone in the cast, meaning the loons. Every utterance and gesture of theirs is overblown, over-reaching and overly exaggerated. The lead actor, Thaddeus Shafer, is supposed to be French yet his accent was atrocious and unconvincing — he even sounded German sometimes… So I am not sure what was going on there. Other than that, Shafer’s performance was fairly menacing, authoritative and well modulated. His banter with the selected audience members reveals he has a good arsenal of improvisational skills for these purportedly unscripted and brief scenes. With its one-note / single idea storyline, Bridel’s short play barely progresses towards a dramatic arc. Conflict and drama are present, to be sure, but Lunatics & Actors proves a disappointing and underwritten play that isn’t nearly as clever nor as funny as it thought it was being. One thrilling aspect is that the 70-minute drama grows increasingly dark towards its highly predictable ending. Of note is the unsettling sound design, devised and executed by Kate Fechtig – its ominous tones greatly adding to the threatening atmosphere and tension throughout. Fred Kinney’s fine scenic design, in combination with Niki Mercs’ interesting and detailed props, creates a turn-of-the-century infused ‘steampunk’ aesthetic for this sterile medical facility and asylum. Directed by Jeremy Aluma, the production is a collaboration with the current Interim Dean of USC’s School of Dramatic Arts, David Bridel. Based on the real life obsessions of famed doctor, Duchenne du Boulogne, Lunatics & Actors takes its audience into the peculiar hinterland of emotional authenticity. The Four Clowns of this performance veer wildly from reason to insanity to Hamlet, and things are never far from becoming completely unhinged. Who is really mad after all – the lunatic or the actor? Lunatics & Actors is the result of a workshop production, which began four years ago when Bridel, presently at USC, approached Jeremy Aluma, Artistic Director of Four Clowns. Bridel told Aluma, a student of his several years earlier, “I have an idea for a production that would serve your company, but would take you down a darker and more mysterious path than you’re used to.” Aluma was hooked and thus began a new phase of their relationship from mentor to colleague that would continue over five shows, four years, and two countries. At this moment in time, however, the new production looks to be the last of their collaborations for the foreseeable future – “a temporary swansong,” Bridel suggests – as the two practitioners look ahead to new and divergent possibilities in the coming months. 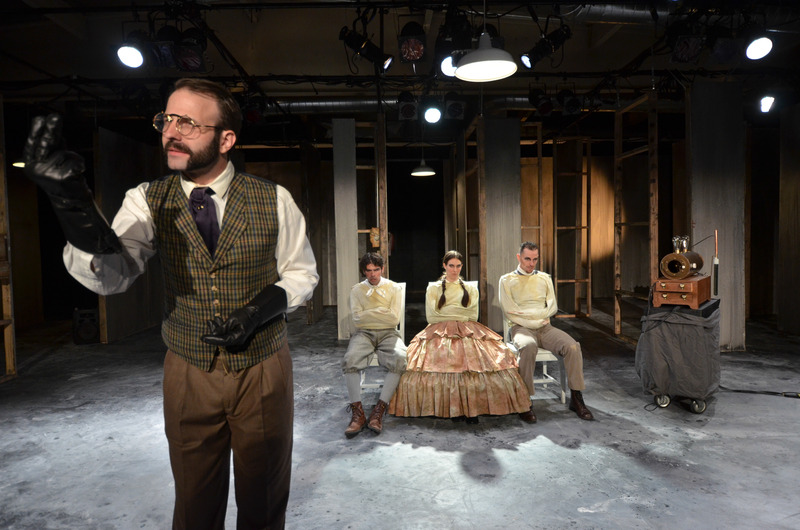 (standing) Thaddeus Shafer as DR. DUCHENNE (seated from left to right) Tyler Bremer as BON-BON, Alexis Jones as FIFI, and Andrew Eldredge as PEPE. Photo courtesy of Andrew Eiden. Show runs 70 minutes, with no intermission.